Our beloved canine friends can sometimes be a pain in the neck when it is time to go on a road trip. 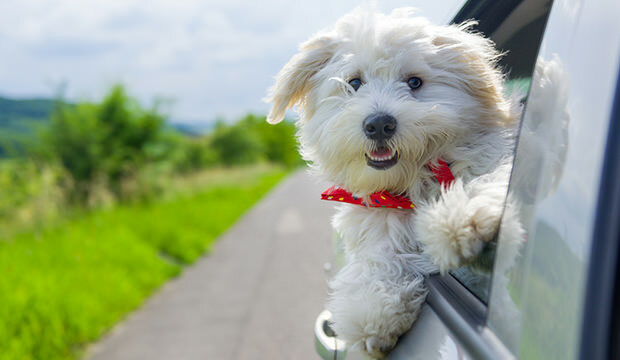 However, with careful planning and by choosing the right safety equipment, bringing your dog on a road trip can indeed be fun and free from hassle. Almost all dogs can be taught to become willing and eager travel companions, but it is up to you – his/her owner – to make sure the trip is safe, satisfying and fun for all. First things first! Before you set forth and hit the road with your four-legged friend you want to make sure that the two of you have all the necessary equipment. This is crucial for keeping Fido happy and safe during those fun car drives. Since you don’t want your doggo to get loose far from home – no matter how disciplined and obedient he/she is – you should make sure the leash, collar and some form of ID tag are taken care of. Check out some best-buy dog collars, dog leashes and ID tags. Always think in advance and bring along a sufficient supply of food and water your dog is accustomed to eating and drinking. Check Out Some Cool Best-Buy Dog Bowls Here! Depending on the weather and time of the year, make sure to bring appropriate blankets and beddings. Also, don’t forget to bring waste disposal baggies for parking lot rest stops. Your dog’s business can be tricky business. Finally, having some old washcloths by your side is always handy when it comes to wiping those muddy paws that have been exploring all those new and intriguing places. Stay tuned for our next article on Dog Car Travel Tips – CRATES AND RESTRAINTS!